Superb apartment with amazing sea views. It has been recently refurbished to a very high standard and all appliances and fittings are new. You can step out of your front door and you are right on the peaceful sandy beach. Large balcony with 180 degree view of the famous Arcachon basin. Open plan apartment with a partitioned off bedroom. Modern bathroom with a bath, power shower and WC. The chic town of Arcachon is a 5 minute stroll along the board walk from the apartment. is a charming trendy seaside town only 40 minutes pleasant drive through forests from Bordeaux and its airport. TGV goes directly into Arcachon town from Paris. The apartment is 10 minutes walk from the railway station. Arcachon is to the west of Bordeaux, and is at the northern end of the longest, sandiest coast in Europe, stretching 200 kilometres to Biarritz - known as the Côte d'argent ('the silver coast'). It is a popular area for holidaymakers from Bordeaux and Paris to escape to, being easy to reach by train. The big attractions in Arcachon are the sandy pine tree covered beaches, the town of Arcachon, and the lovely beach restaurants with delicious fresh seafood. The town itself is very attractive, and the huge covered market with its oyster bar restaurant is to die for. Arcachon is not exposed to the full might of the Atlantic waves, being on the edge of a large inlet, the Arcachon Basin, rather than facing the sea directly. There is a chance for surfers on the Atlantic coast on the other side of the basin. The town is divided into two parts - the summer town (Ville d'été) and the winter town (Ville d'hiver) slightly further inland. As a visitor you will probably spend more time at the waterfront in the summer town. The summer town runs along next to the beach and has a fantastic selection of restaurants, bars and shops. The winter town, the 'Ville d'Hiver' has magnificent and often quite eccentric houses that were built in the second half of the 19th century. - Arcachon contains a large number of interesting and ornate old houses, sometimes almost verging on the Disneyesque, a tribute to the days when many rich merchants set up home here. Various boat-related trips are available from the jetties in the bay. Traditional boats called 'pinasse' are used for these. The boat tours will take you past the beautiful 'cabanes tchanquées' which are fishing cabins on stilts right out in the middle of the bay. They have almost become the symbol of Arcachon. The trips will also take you to a beautiful bird sanctuary and to the point where Arcachon Bay meets the ocean. Cycling is enormously popular in Arcachon and if you bring a bike with you (or hire one) there is a lovely promenade and cycle path that heads south from the beach and continues 30 kilometres to Biscarrosse, via various beaches and coastal towns en route. If you enjoy cycling, don't forget that the whole of the Arcachon coast is backed by the largest forest in western Europe - Les Landes. Until a hundred years ago this was just infested swamp, but was reclaimed and planted with pine trees, and is now a 'Regional Natural park'. It is criss-crossed with cycle paths. Of course, beach activities and boat trips off the coast are available to suit all. If you are a beach lover, even a busy weekend seems unable to overcrowd the beaches south of Arcachon, so you should always be able to find somewhere quiet, if that is what you are looking for. The beach in Arcachon itself is sandy and very calm - sheltered from the strong waves and currents of the Atlantic Ocean beyond the bay. Perfect for families with small children. There are four main beaches in Arcachon, the Plage Pereire, the Plage d'Arcachon, the Plage d'Eyrac et la Plage des Abatilles. 2km away is the Plage du Moulleau. If you are looking for something more dramatic then there are literally miles of white sandy beaches, backed by pine forests and with plenty of waves for surfing and body-boarding. These beaches also have lifeguards surveying portions of them to make them more safe for young and teenage children. If you wish to learn how to surf there are lots of surf clubs offering reasonably priced lessons. And the famous local oysters will undoubtedly tempt you into one Arcachons many restaurants, after all that activity. A large percentage of France's oysters are farmed here and you can visit the farms and learn all there is to know. Firstly, you and your children can pass a happy hour in the baking sun struggling to reach the top of the sand dune (stairs are also available! ), and secondly, the views from the top are simply stunning - out to sea, along the coast, and back across the dunes and Les Landes forests. Fabulous! It really is an interesting and fascinating place to visit and lots of fun. Children (and adults) will spend hours hiking up to the top and then running down at full speed and then starting all over again. It is also possible to para-glide from the dunes, a wonderful experience and again one that is relatively inexpensive considering the time and expertise involved. Certainly an experience you wont forget. The apartment has such stunning views of the bay. Its so peaceful and the town of Arcachon feels safe and clean and friendly with just the best combination of restaurants beaches walks scenery and the covered market is to die for. The uninterrupted views of the peaceful mellow sandy beach and the sea, yet an easy walk to the town with its great restaurants cafes and markets. The apartment is fresh and bright and very well equipped with a huge balcony to just sit and relax and watch the boats bobbing gently in the morning light. toilet, combination tub/shower, All new high-quality fittings. Bath with power shower. WC. Handbasin and central heating. There is a designated parking space near the front door in private carpark. Open plan lounge, dining room and kitchen and balcony. Fantastic 180 degree view of the beach, sea and sunsets. 4 seater dinner table, Coffee table, 2-seater sofa. 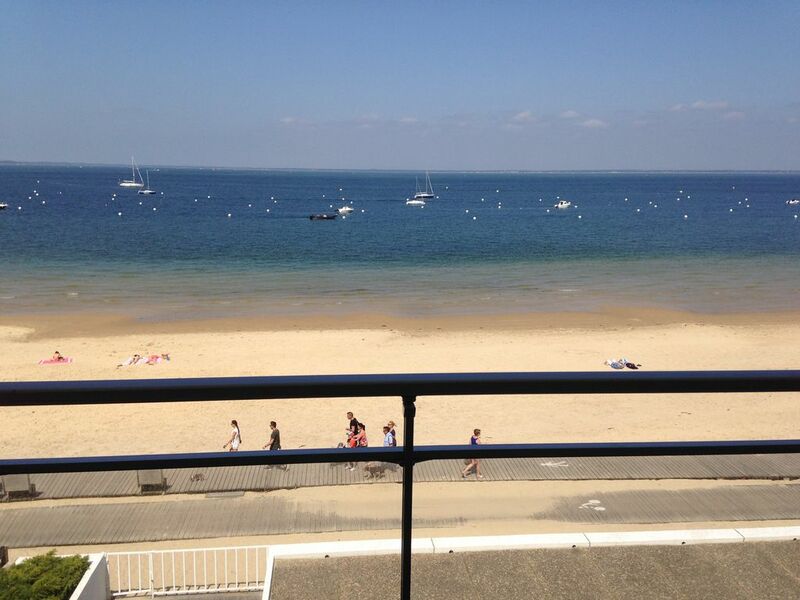 Location très bien située, avec vue sur le bassin d'Arcachon. Très calme. Proche de toutes les commodités. Studio en parfait état, très bien équipé et décoré avec goût. L'emplacement de parking est très appréciable. Le seul point négatif étant le coin nuit un peu exigu. Thus is a well equiped apartment in a superb location. The lovely balcony is right on the sea front and a great place to sit and take in the view. The apartment has a wonderful kitchen and lounge with everything needed for a restful holiday. The furnishings are first class and the tv and efficient wi-fi a real bonus. There is a very snug bedroom - ideal for one person - and a bathroom with bath and shower. Private and secure parking is a bonus and the town of Arcachon with shops and restaurants is just a five minute walk away. I had a really great stay in early February and was well looked after by Alexandrine who met me when I arrived. Highly recommended. Thankyou for your comments. Yes the bedroom is very cosy with the double bed in it! 15 jours de pur bonheur. Appartement sympathique et bien aménagé, propre et surtout très bien situé avec une vue magnifique sur le bassin. Très bon accueil aussi bien à l'arrivée que pour le départ. Lieu idéal pour se reposer ou faire de belles ballades. Merci beaucoup! Nous sommes tres heureux que vous avez apprecie vos vacances. We had a very nice time at this great appartment. It was very clean, the bed was comfortable and the kitchen was well equipped. We loved having breakfast on the balcony and watch the beach. Wir hatten eine wundervolle Zeit in diesem tollen Appartement. Es war sehr sauber, das Bett war bequem und die Küche gut ausgestattet. Wir fanden es toll, jeden Morgen auf dem Balkon zu frühstücken und den Blick auf den Strand zu genießen. L'appartement correspond parfaitement à la description : situation idéale, calme, un mini-marché et quelques commerces pratiques derrière l'immeuble à deux pas, une vue imprenable sur le bassin. Nous avons apprécié la propreté de l'appartement qui est bien équipé, avec une literie de bonne qualité ; de plus l'accueil est très sympathique. Nous avons séjourné une semaine à Arcachon et ce fut parfait !! Accueil très agréable de Madame Raud (avec en plus une petite attention qui fait plaisir) . Superbe location, très bien équipée ( petit bémol : il manque à mon goût un aspirateur et un miroir mural). Immeuble calme, environnement idéal pour se ressourcer . La situation de la location est idéale, nous avons tout fait à pied . Nous reviondrons , c'est sûr ! Arcachon is a prime holiday location. All the beaches are sandy and the area is surrounded by a picturesque pine forest. There are cycle paths all around the basin and cycle hire is easy. This is one of the biggest oyster producing areas of France, so you can see how they are grown - and they are fresh and great value. The massive 'dune du Pilat' is closeby. .40 minutes drive from Bordeaux and Bordeaux airport. In the summer season TGV train from Paris runs directly into the town centre. In the winter season the TGV goes to Bordeaux and there is then a local train directly into Arcachon. Linens, towels and bath mats are available on request at an extra cost of 30€. Please arrange with local contact. All guests are expected clean the flat thoroughly before check-out. This would be inspected during check-out and if the apartment is not left in a satisfactory state, additional charges may be incurred.